The Straits Mummer’s Walk started in 2010, when my friend Sabrina and I talked about how much we loved mummering and how the tradition was losing ground since when we were teenagers. She proposed a walk and we began the organization that December and chose the 29th as the official day of the mummer. The event was planned for our administrative hub in Flower’s Cove. We were greatly impressed that 20 people had the interest on a bitterly cold December day to parade around the Town. Our goal always has been to increase awareness and encourage more mummering at the households. 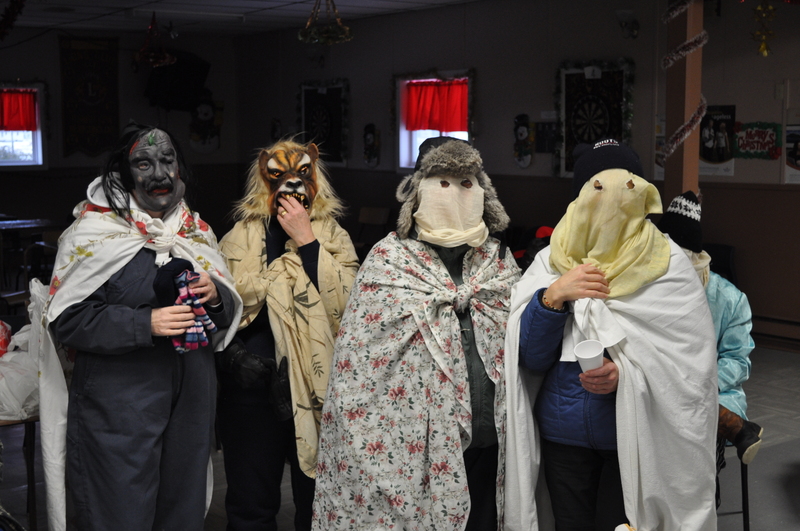 In 2011, at Anchor Point two mummer’s joined us from Switzerland and Germany to learn the art of Christmas mummering. We also visited many households in Green Island Cove that year. In 2012, Savage Cove produced the greatest number of mummers at 44. We were very pleased to see so many younger jannies participate. It was on a Saturday, but still bitterly cold. In 2013, Green Island Cove was our venue with a crowd of jannies joining us from St. Lunaire-Griquet to bring our tally to 40. 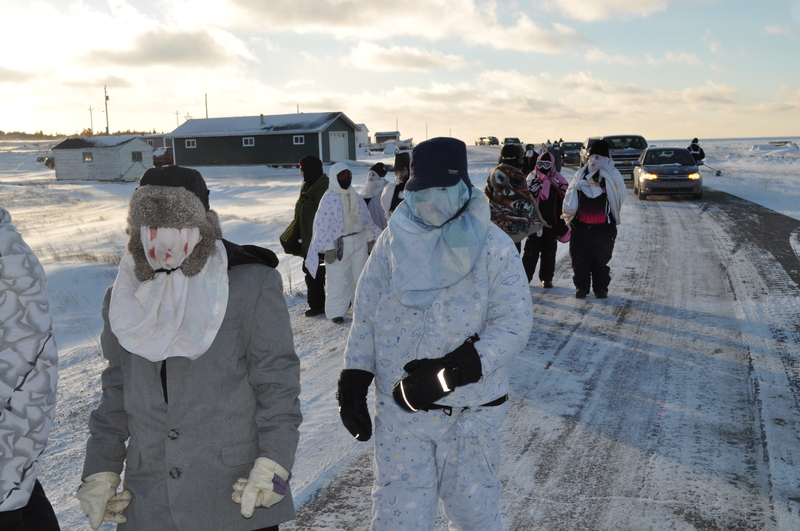 It was a very cold day, so we had a short parade route just using the lower road. It was quit the sight the community had not seen in years. 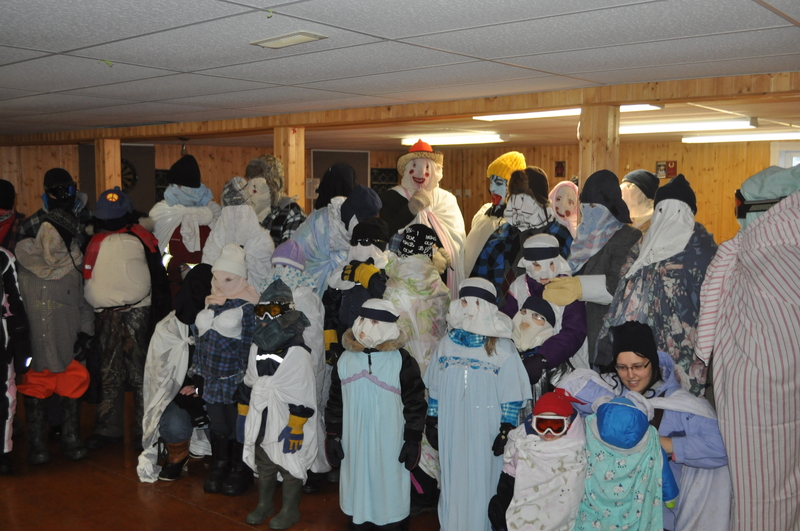 This year, the event was held in Sandy Cove on a Monday and brought out 30 mummers, one as far as Port Saunders. There were big ones and small ones and talls ones and thin. A truly wonderful collection of dress, demeanor and age groups. There are some mummers that come every year and always new ones. I love the influx of new mummers, when an event is held in their own community, but the regional spirit by having those of surrounding communities join in to make the event an even larger success. A couple of tunes were played by Wilga Hughes of Green Island Brook from his accordion and the mummers danced. Then we all marched off to the church and returned to the Lion’s Club. The RCMP and Straits Fire Department were on the scene to ensure safety of our participants. I am very thankful to those volunteers who gave freely of their time for the Mummer’s Walk. After a return to the Lion’s Club, we had Purity Syrup, Hot Chocolate and a few treats. Prizes were drawn and a little music played. Everyone was in the spirit and a number of people went door-to-door mummering that night, at least that is what my Facebook feed had indicated as dozens of mummer’s have been popping up in communities from Anchor Point to Flower’s Cove to Sandy Cove to Green Island Brook and as far as Ship Cove and many places in between. It is exciting to see a resurgence and pride placed in keeping this Christmas tradition alive and well. In recent years, I have seen more interest in the tradition from dances, more local visits and more memorabilia produced. 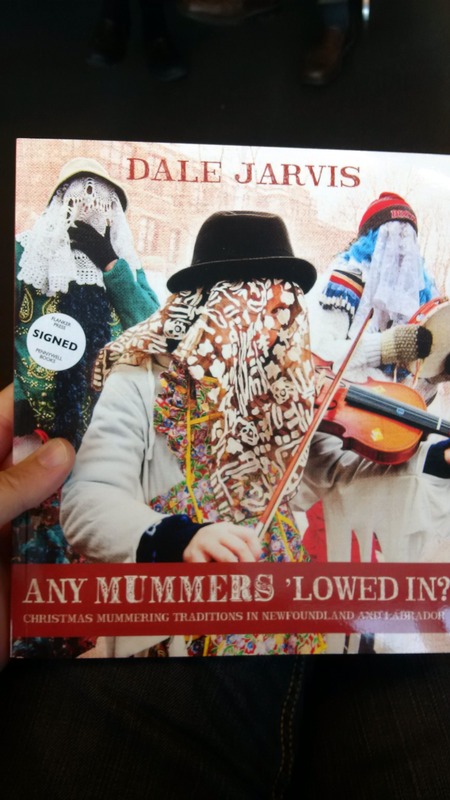 Also this year, I was interviewed by Folklorist Dale Jarvis and photos and pieces of my contribution made print in the book, “Any Mummer’s ‘lowed in?” I encourage people to get a copy and give it a read, there is lots of talk of the Northern Peninsula Mummers or Jannies. I look forward to getting better from this Christmas cold, so I too can join my friends and band about and visit in disguise before Old Christmas Night. I look forward to seeing the Jannies. Come one, come all! 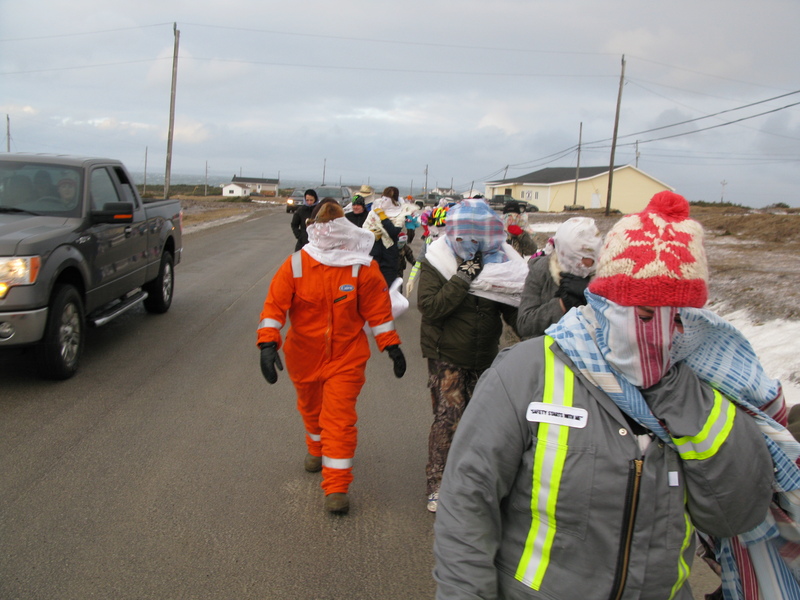 Posted on January 3, 2015, in Community Economic Development, Tradition and tagged any mummers 'lowed in, christmas, dale jarvis, janny, mummer, mummer parade, mummer walk, Sandy Cove, Straits, tradition. Bookmark the permalink. Leave a comment.